You'll be £12.00 closer to your next £10.00 credit when you purchase The Silent Attack. What's this? Everything makes the book extremely enjoyable without weighing the story too much and you are helped by the references of the maps present in the book. 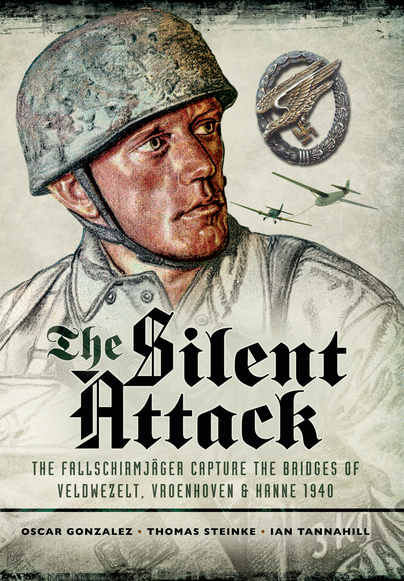 The audacious attack by German airborne forces in May 1940 on the modern Belgian fortress of Eben Emael is well documented; on the other hand, the assault on the three adjacent bridges crossing the Albert Canal near Maastricht is less well known. This book sets out to correct the balance and in a very detailed manner. The authors are to be commended on a very thoroughly put together piece of work. I found the book very interesting and well written with a wealth of detailed information on this very explicit piece of history. The Battle of France depended on surprise attack by large mechanised and armoured forces. This depended on attack through Belgium, and that depended on overwhelming the Belgian forts guarding key river crossings. The authors have produced an enthralling account of how German Special Forces fought to take and hold the key river crossings to allow the main German Army to swarm into France. Very Highly Recommended. The spectacular capture of the Belgian fortress of Eben Emael by a small group of German paratroopers in May 1940 is a story which has been told many times, but often to the detriment of the simultaneous attacks on the neighbouring bridges over the Albert Canal at Velowezelt, Vroenhoven and Kanne. This book reverses that trend, and ignores the fort completely to focus entirely on the planning, capture and defence of these bridges; an operation which, in a matter of hours, swept aside a defensive position which had been intended to delay an entire army for weeks. It is an impressive and beautifully presented book, with a meticulously researched, clear and readable narrative which is generously supported by innumerable photographs, first-hand accounts and a complete list of all those who took part. This must be considered an important addition to the library of airborne literature. A must-have reference for anyone interested in 1940 operations.